We’d love your help. 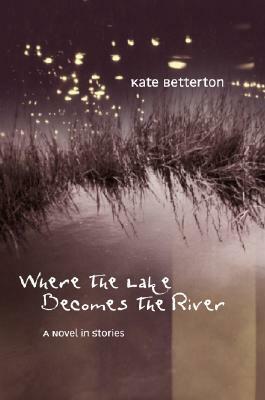 Let us know what’s wrong with this preview of Where the Lake Becomes the River by Kate Betterton. Kate Betterton creates an unforgettable extended Southern family and vividly brings to life its dreams, its disappointments--and yes, even its beloved ghosts. To ask other readers questions about Where the Lake Becomes the River, please sign up. I'd like to know what others think of this book. It's a fascinating read on many levels-- sometimes it reads a little like To Kill a Mockingbird, sometimes like A Thousand Years of Solitude, and sometimes like a debut novelist trying to wrestle a big story into shape. It's not from a big New York publisher, so it's not going to get big attention unless others try it and like it. I've known Kate for several years and she is a wonderful person and a great writer. This book touched me. It explored major issues such as racism and death. It was well written and the characters were full and believable. I enjoyed reading this even though it is outside of my normal genre (sci-fi/fantasy). The only part I did not like was the very last chapter. The entire book follows one character, Parrish, but the last chapter is about her descendants and has totally different main characters, I've known Kate for several years and she is a wonderful person and a great writer. This book touched me. It explored major issues such as racism and death. It was well written and the characters were full and believable. I enjoyed reading this even though it is outside of my normal genre (sci-fi/fantasy). The only part I did not like was the very last chapter. The entire book follows one character, Parrish, but the last chapter is about her descendants and has totally different main characters, which made it feel disjointed and out of the story. A MS writer who explains the Delta in such a way that all can understand it. Great read! Kate Betterton grew up in the Mississippi Delta, and has lived in Minnesota, New England, and the Pacific Northwest. She now makes her home in Pittsboro, North Carolina. Synopsis: Billy Charbonneau, a charismatic young ho Kate Betterton grew up in the Mississippi Delta, and has lived in Minnesota, New England, and the Pacific Northwest. She now makes her home in Pittsboro, North Carolina. Synopsis: Billy Charbonneau, a charismatic young homeless man, flees Seattle for the rugged Cascade Mountains, accused of a crime he didn’t commit. He becomes stranded with Walt McCullough and Eleanor Sakamura, a conflictual yuppie couple who’ve come to the mountains for one last try at rekindling their relationship. These three, and Max, a disfigured but plucky Cairn Terrier who’s adopted Billy, must share resources and work together to survive--or perish. Their struggles are complicated by a serious injury, an early snowfall, and an emerging love triangle. When they hear ghostly bagpipes in the night beckoning them in an unexpected direction, they must decide: is the Piper’s restless spirit intent on leading them to safety—or into even deeper peril? And could the enigmatic young woman who keeps appearing in Billy’s dreams hold the key to his future? For more information about Kate’s work, and some thoughts on writing, dreams, and life after death, please visit www.KateBetterton.com. Kate Betterton's first novel, WHERE THE LAKE BECOMES THE RIVER, won the Novello Literary Award, underwritten by Charles and Katherine Frazier's Cold Mountain Foundation. It was included in PUBLISHERS WEEKLY's Fall Preview: "...examines the impact of the Civil Rights Movement on a Mississippi Artist." Named a finalist for FOREWORD MAGAZINE's Book of the Year Awards, and nominated for North Carolina's Sir Walter Raleigh Literary Award, WHERE THE LAKE was chosen as a NC BookWatch selection. Kate appeared on the popular PBS literary show with host D.G. Martin, and a video of the interview can be viewed on BookWatch's website.